Advances in cancer immunotherapy may help autoimmune therapies defend themselves. Is human immunology basically too crazy complex for the human mind? Evidence to date suggests yes, at least for my mind. In almost every story I write about cancer immunology or autoimmune disease, I learn about previously unknown (to me) functions within the three-ring circus of immune cells. Or I find out about yet more types of these cells, like double-negative T cells, which can defend against graft disease and maybe type 1 diabetes. Who knew? Well, yeah, thousands of immunologists. All of us who follow cancer research, though, do know a (simplified) version of one genuine breakthrough in immunology, checkpoint blockade inhibitors, which garnered Nobel Prizes last October. These drugs take on one of deepest questions in cancer biology: why the immune system doesn’t snuff out cancer cells, which by definition are genetically abnormal, often wildly abnormal. Other headlines in cancer immunotherapy come from chimeric antigen receptor T (CAR-T) cell drugs, treating patients with certain blood cancers in which B cells go bad. The two such drugs with FDA approval work by taking T cells from the patients, reengineering the T cells to attack those cancerous B cells, and reinserting the T cells. This method is often effective when nothing else works, but is always worryingly slow and extremely costly. So there’s plenty of work in labs, and a few clinics, to take a logical but intimidating next step: Engineering off-the shelf T cells to do the job, hiding them from each patient’s immune system with tricks learned from checkpoint blockade research and similar immunology findings. Okay, if those cell-shielding techniques eventually work, can a similar attack be made in autoimmune diseases such as type 1 diabetes? In type 1 diabetes, effective ways to stop the autoimmune attacks from trigger-happy T cells exist only in lab mice. And that’s a problem not just in slowing or stopping disease progression but in trying to treat it. The most promising current approach is to encapsulate insulin-producing beta cells. This has been pursued for many decades, with many barriers. Perhaps the highest (if least surprising) barrier is that the capsules always get clogged up by the immune system. The latest capsule approaches, starting with beta cells made by reprogramming cells, try sophisticated material-science strategies to blunt this attack and may do much better. But as long as we’re already playing genetic games with those engineered beta cells, why not also try the same immune-evading tricks being studied in CAR-T experiments? That’s the basic idea behind efforts by Altheascience, a Viacyte/CRISPR Therapeutics collaboration, and others. Which just maybe will produce capsules that, replaced every year or so as necessary, are working cures for type 1 diabetes. Which we would all fully understand. Why is insulin so expensive in this country? We run on sugar, and sugar needs insulin to get into our cells. It’s no surprise that insulin was the first genetically engineered drug, approved by the FDA in 1982. Synthetic insulin keeps millions of people with type 1 diabetes, and a greater number of people with type 2 diabetes, alive. Basic research keeps turning up surprises about the hormone—its starring roles in the brain, for instance, and its production by some viruses. Drug companies mostly focus, though, on fiddling with how quickly the body absorbs it. Insulin variants that work either very quickly or very slowly are very important, but why can’t we have insulin that doesn’t need refrigeration? Or “smart insulin” that responds to blood glucose levels, first proposed when Jimmy Carter was president? Although Sanofi supports interesting projects aimed at smart insulin, as do the other market leaders Novo Nordisk and Lilly, there’s little visible progress toward the clinic. But the biggest question about insulin is: Why is it so expensive in this country? New entries such as Basaglar, the first biosimilar insulin approved by the FDA, delayed by predictable patent battles but now available, don’t seem to change the story. And the story has plenty of human faces. Among them was Shane Patrick Boyle, who died a year ago, unable to raise the money to buy insulin for his type 1 as he saved up for his mother’s funeral. Look at GoFundMe today to see similar personal pleas for help. As with every other problem in healthcare cost, there are no simple solutions. One new approach comes from the Open Insulin Project and similar biohacking groups that are making worthy efforts to create generic insulins. But those are only early steps in the process, and clinical trials are too expensive to crowdfund. You can argue that in a more rational world, the federal government would step in. Why not launch a 28th National Institute of Health that develops selected high-value high-need generics and biosimilars, brings them through clinical testing and into the clinics? Or simply control the costs of crucial drugs, lowering prices in the years after generics or biosimilars enter the market, as Australia apparently is now doing? OK, not likely. But what actually would help? Insulin-producing cells will be tested first in patients lacking a pancreas. Diabetes is way complex. “But it’s a simple disease conceptually—your body doesn’t produce enough insulin,” notes Joslin Diabetes Center researcher Gordon Weir. In type 1 diabetes, an autoimmune attack wipes out insulin-producing beta cells, which are found in clusters of pancreatic cells called islets. In type 2 diabetes, the beta cells are still there but not hauling all the freight. That disease can be treated with many other types of drugs, along with lifestyle changes. But over time, beta cells wear out. In fact, more people with type 2 take insulin than people with type 1. And there’s no way to make insulin injections pleasant or easily controllable or as good as insulin production by beta cells. Thus the huge interest in a long-term research project spearheaded by Harvard’s Doug Melton to create working beta cells by manipulating stem cells. An update on the ambitious project from Melton, Weir and other partners drew a crowd at Harvard on Monday. Technology from Melton’s lab has been licensed exclusively to the startup Semma Therapeutics, which is joining with Joslin, Brigham & Women’s Hospital and Dana-Farber Cancer Institute to move toward clinical trials. Traveling under the ungainly title of the Boston Autologous Islet Replacement Therapy Program (BAIRT), the collaboration launched in June. The first BAIRT studies, starting at least three years from now, will not be among people with type 1 diabetes. Instead, they will recruit people who have had their pancreases removed, usually because of uncontrollable pain after the organs are chronically inflamed by years of heavy drinking. This approach bypasses the biggest problem in cell treatments for type 1 diabetes: the body renews its autoimmune attack and wipes out the newly introduced cells. “We decided to solve one problem at a time,” Melton explained. Patients who have prostatectomies often now are given islet cells salvaged from their own pancreas, which helps to improve their diabetes control, but those cells may themselves be damaged or in short supply, said Brigham surgeon Sayeed Malek. Transplants of brand-new beta cells, made from the patients’ own blood, should help. These reengineered cells will be injected in the arm, where they will be easy to monitor and to remove if necessary, said Semma CEO Robert Millman. Decades of experience transplanting cells from cadavers has shown that “you can put beta cells just about anywhere,” Weir added. Against autoimmunity. If all goes well, the project will continue into trials for type 1 diabetes with non-personalized beta cells, where the autoimmune attack will be blunted via encapsulating the cells. Seema is spending about half its budget on encapsulation technologies, Millman said. Encapsulation is the near-term solution to fend off the autoimmune attack. “The long-term solution is to use the power of biology to understand why the immune system has made this mistake,” Melton remarked. He briefly mentioned two promising research thrusts. One effort is to learn from the rapid advances in knowledge about how cancer cells dodge the immune system. Another, led by Chad Cowan of Massachusetts General Hospital, aims to create a “universal donor pluripotent stem cell.” Missing all the billboard signs that alert immune enforcers, these cells could play a role like that of O-positive cells in blood transfusions. Asked about his own take on the causes of type 1, Melton mentioned one theory that the autoimmune attack may be triggered by gut cells that naturally produce insulin or similar substances under certain conditions. Among potential safety risks, all stem cell therapies must be carefully vetted to avoid the growth of teratomas—tumors with a jumbled mix of cells, usually benign. These cellular junk piles would be relatively easy to remove, but much better to avoid altogether, Millman said. Another concern is that the cells will secrete insulin even when it’s not needed, dropping the recipient’s blood sugar levels to dangerously low levels. There also is much cause for worry that the cells won’t last long, a major problem in transplants of cadaver beta cells. However, built-from-scratch cells function “for more than a year in mice, which bodes well for people,” Weir commented. And Millman pointed out that the cells resemble juvenile cells, which may help them withstand the high stresses of transplantation better than worn-out adult beta cells do. “We hope these almost pristine cells going into the patients will last a lot longer,” he said. None of this will come cheap. Asked about pricing for cell therapies, way down the road when and if they hit the market, Millman was understandably wary. Initial costs for these treatments will be very high, accompanied by very close regulatory scrutiny. Semma has raised about $50 million, but “we need philanthropy and we need institutions to support this,” he said. Mouse regulatory T cell and human T cell, courtesy NIAID. The autoimmune attack that triggers type 1 diabetes has been beaten in the non-obese diabetic mouse, the best animal model of the disease. More than 500 times, in fact, notes Jay Skyler, professor of medicine at the University of Miami. 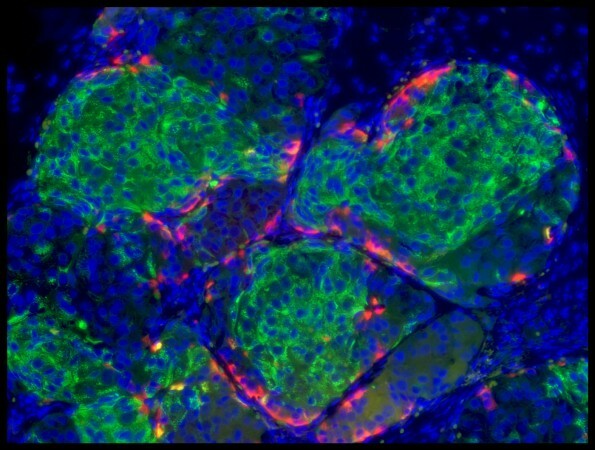 Researchers have painstakingly picked apart the genetics of the disease and many of the intricacies of the immune attack that wipes out insulin-creating cells in the pancreas. And recent studies suggest that we might, just might, have a smoking gun in the form of disease-triggering populations of gut microbes. But we don’t really know the trigger mechanisms and we really can’t stop the disease. However, as Skyler reviewed the disappointing decades of type 1 trials in a lecture last week at Joslin Diabetes Center, he pointed out research approaches that might lead closer to a cure. Among them: examining the effects of treatments by subgroups (such as age), coordinating dosing with the timing of immune events, and administering multiple doses or higher doses of a drug. Given the unending complexity of the immune system, though, maybe the most promising strategy is to hit it at multiple points. That’s the thinking behind Skyler’s upcoming Diabetes Islet Preservation Immune Treatment (DIPIT) trial. • exenatide (a synthetic hormone that boosts glucose-dependent insulin secretion). When he first proposed this kitchen-sink idea, “everybody said I was crazy,” Skyler remarked to his Joslin audience. The trial did get FDA approval. He’s still looking for funding, though. Okay, let’s contrast these combinations with those in another arena of biomedical research that’s almost the reverse of type 1: cancer immunotherapy. This field tries to activate (rather than suppress) the immune system at multiple points. Also unlike the case with type 1 and other autoimmune diseases, it is awash in drug-discovery money. In fact, we’re living in the breakthrough decade for cancer immunotherapy. The two clear winners so far are CAR-T cells (chimeric antigen receptor T cells, in which a patient’s own cells are re-engineered to seek and destroy blood cells gone bad) and checkpoint blockade drugs (which prevent tumors from presenting false IDs). The first checkpoint blockade drug approved by the FDA targets CTLA-4, a surface receptor on T cells and B cells. About a fifth of advanced melanoma patients given the drug survive for ten years with no further treatment. And in clinical trials, combining a CTLA-4 inhibitor with a drug that clogs up another checkpoint receptor, PD-1, has significantly broadened the population of survivors. Combination is a familiar theme in cancer treatment, since tumors are so adept at evolving to resist whatever you throw at them. There are very high hopes for adding immunotherapies to the mix. And in that mix, proven treatments like checkpoint blockaders will be joined by other drugs that hit different points of immune activation. There’s much excitement, for instance, about agents that activate the STING (stimulator of interferon genes) pathway, which can kick off defenders in both the innate and the adaptive immune systems and maybe act as a kind of cancer vaccine. In both cancer and diabetes, nothing will be easy in bringing combination therapies into clinical trials and then ideally into regular practice. Researchers must identify exactly which patients might benefit from which combos, juggle drug dosages and timing, watch for serious side effects and struggle to quantify any improvements in health. These will be long rough roads. But for some patients, we hope, combos will lead to cures. 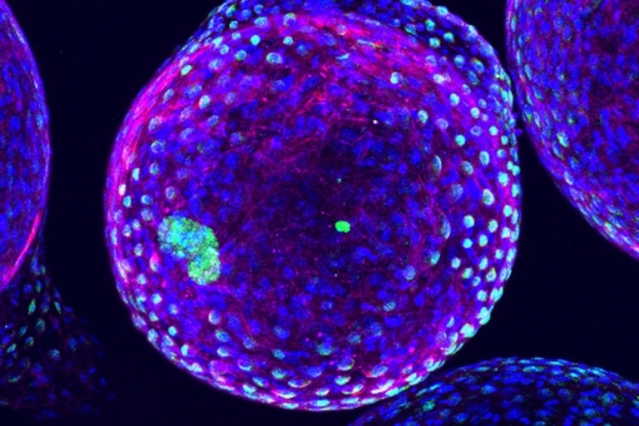 An MIT alginate microcapsule holding islet cells (in green) and being covered by immune cells (in blue and magenta). Image credit: Omid Veiseh, Joshua Doloff, Minglin Ma and Arturo Vegas. There’s a worldwide deficit in insulin-producing beta cells, for people with either type 1 or type 2 diabetes, Harvard’s Doug Melton told a session at the ADA annual scientific conference on Friday. Currently, it takes his lab about 40 days to produce the cells at a cost of about $6,000 per flask, but Melton is confident that these numbers can be chopped down. The achievement required not only brilliant scientific detective legwork, especially on the last steps of differentiation, but lab drudgework on a dramatic scale. Picking apart the steps that drive cells into beta shape, “we had to sort out three or four factors at a time,” he noted. 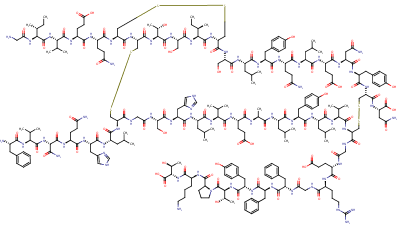 The lab ran screens of small molecules to find what combinations were effective. Testing eight small molecules, in three concentrations, for different periods, in triplicate meant about 65,000 combinations to examine per screen. The lab of MIT bioengineer Dan Anderson, collaborating with Melton to build microcapsules for the beta cells, took high-volume testing to a much higher level for various capsule designs. Over the decades, many groups have tried to encapsulate beta cells in tiny spheres of alginate. Historically, “all these capsules end up covered in scar tissue,” Anderson told the ADA session. But after endlessly tweaking the properties of these spheres, “we have a growing list of materials we could use,” he said. One capsule material seems to work well in mice with strong immune systems—and in very early testing in macaques. Details on the material aren’t yet public, but the secret isn’t in the material’s permeability but in how the immune system reacts to it, Anderson said. Insulin was the first hormone to be genetically engineered for human use, and synthetic insulins now control blood glucose levels for almost everyone with type 1 diabetes and millions of those with type 2 diabetes. Many variants of the molecule have been designed to act quickly or slowly or in between, but the Holy Grail is smart insulin—which would not only work over many hours but automatically adjust its own release to keep blood glucose levels in a good range. Many labs have taken a stab at smart insulin since the first attempt in 1979. New approaches keep cropping up, and a few show particular promise in animal tests. A “nanoparticle network” reported in 2013 is one of the more interesting. These nanoparticles combine insulin, dextran (a complex sugar often employed to slow down glucose effects) and enzymes that target glucose. Given opposite electrical charges, the nanoparticles are thought to clump together in the body rather than wander off in the bloodstream, doing their duty like a tiny pancreas. The current commercial champion for smart insulin, though, began back in 1999 with research by Todd Zion, then an MIT graduate student in chemical engineering. Zion came up with a design that combined modified insulin with a sugar gel, and worked dramatically well in rats. He and his colleagues spun out a startup firm called SmartCells in 2003 and honed the technology well enough to get the attention of Merck, which snapped up SmartCells in 2010. Last spring, Merck remarked that it would bring a L-490 smart insulin based on the company’s technology into a clinical trial this year. But there’s been no news from Merck since, and the National Institutes of Health’s clinicaltrials.gov site doesn’t mention a trial for L-490. So we’re still in the animal labs. But I’m still encouraged by last month’s paper in the journal PNAS on a different approach to smart insulin, developed by a team led by MIT’s Daniel Anderson and Robert Langer. This group found that an engineered insulin with the sprightly name of Ins-PBA-F performed very well, maintaining good glucose levels in the blood of mice without functioning pancreases over more than 12 hours and also behaving itself in normal mice. Which sounds like L-490. But the researchers suggest that the approach Ins-PBA-F spearheads may offer better control and safety in the long run than L-490 because it’s more like normal insulin. In theory, such a directly modified insulin molecule may be safer from immune reactions and other side effects than smart insulins that add gels or other types of protein barriers for glucose, as do L-490 and most other approaches. If so, that benefit will appeal mightily to the FDA, which will give extremely tight scrutiny to a radical new drug that could be used around the clock by many millions of people. A successful smart insulin will be very far from a niche product. Anderson and Langer (who may well hold the world record for co-founding biomedical startups) have the attention of the venture capital community. I hope that successors to Ins-PBA-F will indeed move toward clinical trials, and eventually the clinic. That might be a very smart bet. Update: Merck actually but very quietly moved its smart insulin into a two-part clinical trial in fall 2014.